APRIL 01 – MONDAY – State election. Mr. Warren moved in upstairs today. I worked in the shop until noon and then went down and voted. I went to the shop again after dinner and drew $60.00. It was the wages that had accumulated during the winter as Mr. Crofut has paid us but little money since last Thanksgiving. After I drew it, I went into the street and distributed it to my creditors and paid my interest to Alfred Gregory - $24.00. I went into the street in the evening to compare accounts with Noah Hoyt and to mail a letter for Father Griswold. It commenced snowing just before night and it was coming thick and fast when we retired. I paid 9 months’ dues to the Hatters’ Society – 90 cents. I took my watch away from Woodford’s in the evening. APRIL 02 – TUESDAY – It was still snowing hard this morning and continued through the forenoon. I have worked hard all day in the shop. Zerah Hoyt paid a garnish and with it was bought eggs and cider. I came home by way of George Starr’s shop and got a bag of shavings. George was at the Democratic meeting at the Concert hall last evening and while setting down the election figures for his own gratification, was mistaken for the Jeffersonian’s reporter and was given three groans and then a vote was taken to put him out, but he saved them the trouble by going himself. The returns they received last night were quite favorable for them and they thought that they had carried the state, but today the scales have turned and they laugh from the other side of their mouths. We have carried the state. Governor Buckingham is elected by a larger majority than last year. We have a majority of both branches of the legislature, but we have lost O. S. Ferry of this district for Congress. I attended hatters’ meeting this evening. APRIL 03 – WEDNESDAY – It snowed a very little this morning. I have worked all day in the shop. Mother called on her way to meeting while we were at tea. We both attended. The classes met together in the Lecture Room for a Prayer Meeting. After the meeting, I wrote a letter to Brother Goodenough ordering 6 dozen Sunday School Hymn Books and sending the amount of his last bill. APRIL 04 – THURSDAY – Pleasant. I went down to the Office to mail two letters for Father Griswold and one for myself to E. Goodenough with $7.40 money and an order for books for the Sabbath School. The Office not being open, I came back to breakfast and then went to the Depot when the train went out and sent it by Express. I got $3.00 from S. Stebbins to make out the amount and gave him a check on the Pahquioque Bank for the same amount. I worked all day in the shop I went to market in the evening, but did not get to class. APRIL 05 – FRIDAY – Pleasant. I have worked hard in the shop. Six dozen hymn books for the Sunday School came for me by express by the morning train which I left at the church on my way home from the shop. I went to drill in the evening. Gussie went to the Sewing Society at John Rowan’s. APRIL 06 – SATURDAY – Pleasant. I have worked at the shop. We have had a bushel of oysters at the shop this noon. They were bought with garnish money. At 3 o’clock, I went up to Concert hall to vote on the nomination of Postmaster. The first was an informal ballot which was as follows: Dr. E A. Brown - 184, Charles Fry – 118, Henry Smith – 54, Armstrong – 52, Eli Mallory – 46, Charles Bennett – 3. The second ballot was as follows, 454 votes cast, necessary for a choice, 228. Dr. Brown received 247 and was elected, after which the meeting was adjourned. I then went down to the shop, from there, up to Brother William Scofield’s for a scion of his White Ox Heart cheery tree to graft on to my Red Ox Heart tree. I came home and grafted it, also one for Abel. I stayed at home in the evening and wrote up Fannie’s Infant Class Book for her and did some writing for the Sunday School and some for myself. APRIL 07 – SUNDAY – Pleasant. Brother Pegg preached in the morning from John 11:40. A German preacher, Mr. Jost, was in the Sabbath School and talked a little to the school. Father Griswold preached in the PM. Subject, the importance of a faithful ministry. The foundation of his discourse was taken from Ezekiel 11 and Acts 1. After meeting, I went to Dr. St. John’s with Gussie and had him extract a tooth for her. We attended Prayer Meeting in the evening. The church was crowded. Mr. Jost was present and exhorted, told his experience, etc. Father Griswold was also present. He gave an invitation to all such as would seek the salvation of their souls to come forward to the altar, when quite a number presented themselves. The meeting was a good one. On my way to church, I mailed a letter to Carlton & Porter for a subscription to the Sunday School Advocate for 6 months for one of the scholars. APRIL 08 - MONDAY – Pleasant. I have worked all day in the shop. After tea, I made out a report for our Sunday School to go to Conference and carried it to Brother Pegg in the evening. APRIL 09 – TUESDAY – Pleasant. I have had work in the shop. D. K. Hickok, the clothes dryer man, called to the shop to see me in the forenoon. I went to the Wooster House in the PM to see him and again in the evening, accompanied by Andrew Knox. I would like to buy the right for this county, but think it exceedingly doubtful about raising the money. APRIL 10 – WEDNESDAY – I did not go to the shop today on account of seeing Mr. Hickok, the patenter and proprietor of the clothes dryer. I spent nearly all the forenoon with him. I then found George in the street. He came home with me to dinner, after which we prepared father Griswold’s hot bed in my garden and sowed some tomato and pepper seed and put my dahlia roots in it to sprout. We sent out Father Griswold’s cabbage stumps and my own and moved tow stoves for them. I cut George’s hair for him and then he went home without staying for tea. Abel, with some help which he procured, raised father Griswold’s barn and nearly covered it. I went to class in the evening. I have deferred buying the county rights for the clothes dryer until Father Griswold returns from conference. The news today is alarming. War seems to be inevitable between the North and the South. APRIL 11 – THURSDAY – The day has been pretty warm. I have worked in the shop. I did not go to church in the evening, but stayed home and did some writing. APRIL 12 – FRIDAY – I have worked in the shop all day. Aunt Louisa’s Cousin Betsy died this morning at the Poor House. I went to drill in the evening. Several officers of the Bethel Company were present. It was the Quarterly meeting, but because of the hard times, no dues were paid. APRIL 13 – SATURDAY – Rainy. It is reported in the papers today that the rebel batteries, together with Fort Moultrie, have opened fire on Major Anderson at Fort Sumter in Charleston Harbor I South Carolina and that the major has returned fire. I went into the street in the evening to get the news if there was any. The news by telegraph states that Fort Sumter is on fire and that the flag is at half-mast and the Harriet Lane is sunk. It may be correct or it may not. I have worked all day in the shop. APRIL 14 – SUNDAY – Pleasant with the exception of a shower just before evening meeting. Brother Pegg, being at Conference, we have had Prayer Meeting all day. Gussie stayed at home in the evening and I went alone. The telegraph has been at work all day receiving the war news. It say that Fort Sumter is on fire and that Major Anderson has surrendered to the rebel forces commanded by General Beauregard. I don’t believe it myself. Neither shall I until I hear more tomorrow. 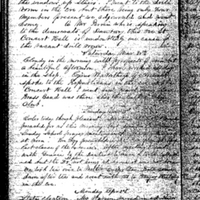 APRIL 15 – MONDAY – The surrender of major Anderson at Fort Sumter is confirmed. The fire from the rebel batteries was too hot for him, burning the inside of the fort until all the wood works (the officers’ quarters, etc.) was consumed by the red-hot shot and shell. The President has issued a call for 75,000 troops from the militia of the adhering states. I have worked all day in the shop. It clouded over in the PM and rained a little in the evening. I attended the Annual Meeting of the Teachers and Officers of the Sunday School in the evening, but on account of the absence of three officers of the Society, the meeting was adjourned for one week. APRIL 16 – TUESDAY – It has rained all day with a hard wind. I have worked in the shop. Our company assembled in the drill room in the evening. We are expecting to be called into the service of the government immediately, as the President has issued a call for 75,000 men from the states adhering to the Union. We are hourly expecting an order from our Governor. APRIL 17 – WEDNESDAY – I have worked in the shop during the day. I attended a special meeting of our Guards at our hall in the evening at which we volunteered our services to our Governor (Buckingham) as volunteers in the United States service in answer to the President’s call for 75,000 troops. There were a large number of spectators at the room and when we, with one voice, offered our services, a long loud shout went up from the people. APRIL 18 - THURSDAY - Today has been spent mostly in parading the street and hoisting the Stars and Stripes I received my pay from Mr. Crofut preparatory to my going away. The bells began to ring in the PM on account of a dispatch from the Governor accepting our services for the government. Supposing that we were to leave this afternoon, I went home immediately and packed what clothes I intended to carry, bid goodbye to my wife and friends, and started for the Hall, but we did not go, so I returned home again. Copied from Pocket Diary written while in Camp during my three months’’ enlistment in the service of the United States. APRIL 19 – FRIDAY – I went to the shop in the morning to get my shop clothes and my tools. I came home and completed my preparations for leaving my home. We took dinner over to Father Griswold’s. He broke a bottle of wine to drink together before my departure. After dinner, I bid goodbye to all and started for our Hall. Before taking the train (which was the freight), the Company paraded up as far as Franklin Street and down to Concert Hall where, unexpected to me, Father Griswold was waiting to pray with and for us as we left our native town. After the prayer, we went to the depot where the train was in readiness for us and a large concourse of people waiting to bid us perhaps a last farewell. After shaking hands with a thousand or less, we finally moved off amid deafening cheers. A number more enlisted in our company in Norwalk. We arrived in New Haven about 6 PM. A delegation from the New Haven Greys escorted us to the New Haven Hotel where we were quartered. In the evening, we were serenaded by the New Haven Cornet Band which played beautifully. We are the first company in the state to arrive at the rendezvous. APRIL 20 – SATURDAY – Three other companies arrived today. We spent a part of the day drilling on the Green. We were escorted by Ex-Colonel Gregory to the cars in the PM. He made a short speech on the platform of the rear car previous to starting. APRIL 21 – SUNDAY – Pleasant. We were sworn into the service of the United States by Colonel S. Loomis of the 5th U. S. Infantry. The examination and administering of the oath was done on the Green in front of the State House. The examination was not very close. APRIL 23 – TUESDAY – Pleasant. Drill in the morning and in the PM. After tea, we changed our quarters from the hotel to the State House. APRIL 24 – WEDNESDAY – Judah P. Crosby and Charles T. Stevens came onto the Green in the forenoon. They were on their way to Hartford to procure overcoats for our company. In the PM, we pitched our tents on a field near the hospital and went into camp. Rain in the evening. We continue to go to the New Haven House for our meals. APRIL 25 – THURSDAY – Pleasant. Received a letter from Gussie. I was detailed for guard duty at noon to continue until tomorrow morning. APRIL 26 – FRIDAY – Pleasant. I tried my revolver this morning by firing it a mark. It gave me good satisfaction. It shoots well. My feet are very sore. I retired very early or rather bunked in my tent. Retiring is rather too refined an expression for camp life. APRIL 27 - SATURDAY – We drilled in squads in the AM. The Captain excused me in the PM to go to the city to get my boots mended. A. H. Byington, one of our members, mended them for me after getting permission from a shoe maker to use his seat for the purpose. APRIL 28 – SUNDAY – I attended the 1st Methodist Church, Dr. Kennedy, preacher. Text in the AM, Hebrews 10:35. In the PM, it was Revelations 2:17. George Allen, along with several others and myself, attended. Prayer Meeting at the same place in the evening. It has stormed all day and in the evening. APRIL 29 - MONDAY – Clear this morning with a rainbow. Squad drill in the AM. I had the headache in the afternoon and evening and did not eat any supper. APRIL 30 – TUESDAY – Discontentment amounting to almost mutiny in our Company on account of our rations. A sergeant belonging to the Meriden Company was court martialed for disrespect to the colonel. Cold in the evening. I retired with a tooth ache. Purdy, Horace, 1835-1909. “Horace Purdy Journal, April 1861 Entry.” Horace Purdy Journals, MS 044. WCSU Archives, 18 Oct. 2018. Accessed on the Web: 19 Apr. 2019.